Legend has it that if you catch a unicorn, you will have good luck for the rest of your life. That's convenient, eh? It's easy to see why everybody would be on the prowl for a wild unicorn to tame and keep for themselves, but it would be easier to see why you might want one for the bright new addition to your family! Your little cutie pie already lights up your life with the magic in her smile and the shine in her big eyes. 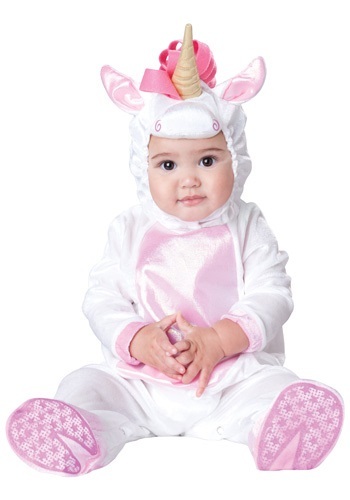 Now she can put that power to good use in this adorable Infant Magical Unicorn Costume. This cute costume makes a great first Halloween costume idea! Party-goers will stop chatting and put down their punch when they realize they are in the auspicious presence of a mythical creature such as your daughter. She's sure to be the focal point of any get-together when she's dressed like the most loved and sought-after creatures in the universe! (It's either the costume that's got them so enthralled or that pesky myth that says unicorn blood grants eternal life). Let's cross our fingers for the former, yeah? What is a unicorn after all without a soft coat, bright colors, and that angelic horn? Well, we included all of that in our polyester Infant Magical Unicorn Costume. It's made up of a white velvety jumpsuit for comfort and cuteness, with skid-resistant purple feet (plus hoof-shaped grips) for safety, and velcro at the back for an easy in-and-out. featuring a corset style dress, faux fur leg warmers, and an attached mesh petticoat. Slip your little one into this and you'll have your friends in a downright trance, thinking they've stumbled into the best type of fairy tale.